NASA's Commercial Crew Program aims to encourage private American spaceships to start flying astronauts to and from the International Space Station by 2017. SpaceX and Boeing are on track to meet this deadline, representatives of both companies say. The private spaceflight companies Boeing and SpaceX are on track to start launching NASA astronauts to the International Space Station by 2017, representatives of both firms said Monday (Jan. 26). 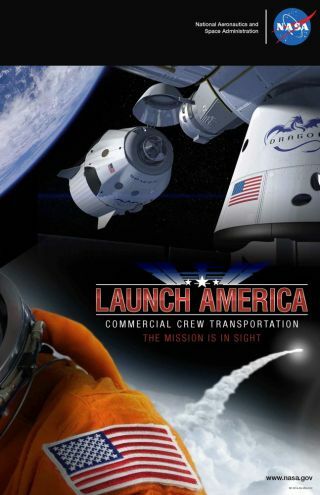 In September 2014, SpaceX and Boeing were awarded contracts under NASA's commercial crew program to help them start flying astronauts on missions to the space station from U.S. soil in the next few years. SpaceX and Boeing are planning to launch a series of tests of their spaceships — capsules called Dragon V2 and the CST-100, respectively — from this year through 2017. The tests will make sure the launch systems are in good shape before the spacecraft make their first official runs to and from the station. The space agency has required that commercial providers like Boeing and SpaceX meet or go below a $58 million average price per seat, according to NASA officials. Both Boeing and SpaceX representatives have said that their per-seat cost is at or below the current price of a Soyuz seat. "The contracts we've signed with our industry partners Boeing and SpaceX are vivid examples of American innovation at work," NASA administrator Charles Bolden said in a news conference Monday. "We've seen the return of an American launch industry and the in-sourcing of work and jobs back to U.S. shores. Our reliance on a commercial space enterprise where we hand off low-Earth orbit transportation to the private sector is critical to our journey to Mars." SpaceX is receiving $2.6 billion of the $6.8 billion total contract, with Boeing awarded the other $4.2 billion. Since receiving the funding, the two companies have been steadily working toward meeting various new milestones within the program. Bolden is also optimistic that the forthcoming federal budget proposal from the White House — scheduled to be released next week — will treat the commercial crew program well. NASA conduted a briefing on the status of the Commerical Crew Program, at Johnson Space Center in Houston, Texas, on Jan. 26, 2015. "Congress has started to understand the critical importance of commercial crew and cargo," Bolden said. "They've seen, as a result of the performance of our providers, that this is not a hoax, it's not a myth, it's not a dream. It's something that's really happening. I am optimistic that the Congress will accept the President's proposal for commercial crew for 2016." SpaceX's plans under the commercial crew program are expected to heat up this year. The company plans to launch its first abort test for Dragon "in the next month or so," SpaceX COO and president Gwynne Shotwell said during the news conference. The company is then expected to perform a second abort test later in 2015, Shotwell added. After those two tests — which are designed to show how Dragon V2 would respond in the event of a problem during liftoff— SpaceX representatives are hoping to launch an uncrewed test flight using the company's Falcon 9 rocket in late 2016, with its first crewed mission using the launch system coming shortly after that, in early 2017. "We certainly understand the incredible … responsibility that we've been given to build the systems necessary and capable of flying crew," Shotwell said. Artist's concept of Boeing's CST-100 spacecraft near the International Space Station. Boeing should start launching many of its test flights in 2017, said John Elbon, Vice President and General Manager of Boeing Space Exploration. The CST-100 is designed to fly to space atop a United Launch Alliance Atlas V rocket. Boeing is expected to perform a pad abort test of its CST-100 spacecraft in 2017, with the first uncrewed flight to the space station launching in April 2017. Boeing's first crewed flight to the station should occur in July 2017 with a Boeing pilot and NASA astronaut aboard, according to Elbon. The company's first official mission to the station should happen before the end of 2017, Elbon added. "Lots of great progress," Elbon said. "We're on track, and it's just as exciting as can be to be part of it."